In 1912, an article entitled More Slavery in the South was published by The Independent. (The online source, Documenting the American South, University of North Carolina, Chapel Hill, does not give the location of The Independent, but I assume they refer to the New York newspaper that was published from 1848 to 1921. The newspaper covered social topics, primarily opposition to slavery and religious subjects.) The article was written by a reporter from a transcription of an interview with an anonymous African-American domestic worker living in Georgia. The interview documents the other side of the loving and loyal mammy myth. At the end of the article, she suggests that Southern white women should be allies of their black domestic workers. 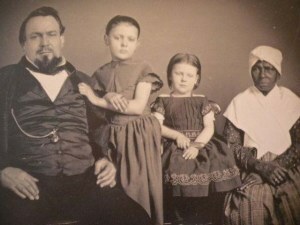 “If none others will help us, it would seem that the Southern white women themselves might do so in their own defense, because we are rearing their children—we feed them, we bathe them, we teach them to speak the English language, and in numberless instances we sleep with them—and it is inevitable that the lives of their children will in some measure be pure or impure according as they are affected by contact with the colored nurses.” What a reasonable but naïve proposal! You are currently reading Slavery in the South: 1912 at JUST LIKE FAMILY.